Recently we’ve released several features designed to enable analysts to easily collaborate. One of the most important additions is the ability to share queries. When you’re viewing one of your saved queries, just click the Link Sharing button above the editor and turn on link sharing to let others see your query. They’ll see any updates you make to the query too, so there’s no need to paste new versions into email. You can now also add metadata to your BigQuery resources. You can add and edit descriptions for your datasets or tables, making it easier for you and your team members to understand them. You can also create custom labels that can consist of any keys and values you choose, which can serve your team as keywords to search your datasets and tables. Click the pencil icons on the Details pages for a dataset or table to edit the metadata. You can now edit individual column descriptions through the UI: in the Schema view for a table, click the Edit Schema button to edit descriptions for existing fields or add new ones. The Google Cloud Public Dataset Program gives you access to more than 100 valuable sources of data—from census data to Bitcoin transactions to human genomes—all at BigQuery’s standard analysis pricing. 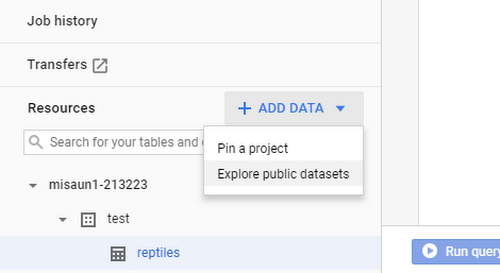 Now you can include these datasets in your BigQuery queries to find your own insights or join them with your own data. Just choose the Add Data option in the Resources section and select Explore public datasets to visit the marketplace. 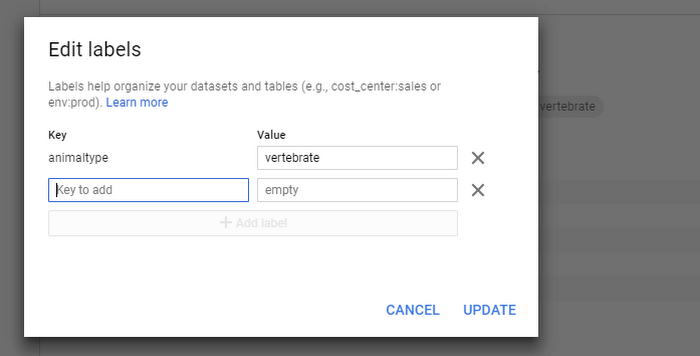 Browse the marketplace for the dataset that you want, then select View Dataset to see and query it in BigQuery. You’ve told us that it can be hard to find a specific query of interest in a lengthy query history. As such, sorting and filtering your personal and project query history have been highly-requested features. Now you can do both. Sort by the query’s date, duration, duration/MB, input bytes, slot time, or slot time/MB. Filter by the query text, bytes processed, job ID, job status, user email, and the start and end time. You can also combine filtering conditions logically to create more complex searches. The features above are just a few of the items we’ve been working on. We’ve also made lots of updates to improve performance, security, and reliability. For example, when you have many columns in your table, the results view and table previews now load 5-10 times faster when you first view them. For easy creation of secure tables, you can now also use the UI to create tables with your own managed encryption keys (learn more in our CMEK documentation). You’ll also notice a variety of small visual improvements like better text-wrapping and getting-started messages for anyone who hasn’t run queries or added datasets yet. And of course we’ve fixed many bugs—thank you for helping us by reporting them! We hope you find the interface for BigQuery useful. We’re hard at work on new features and we look forward to sharing more soon. In the meantime, please keep sending us your feedback by selecting the Send Feedback option at the top right of the Google Console while you’re using BigQuery.